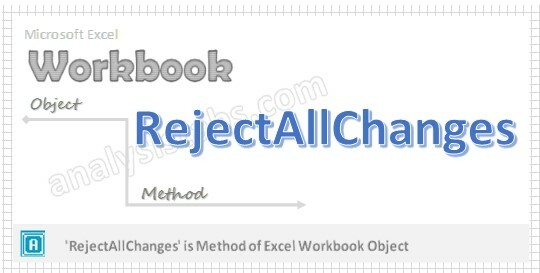 RejectAllChanges Workbook method in VBA is used to rejects all changes in the specified or mentioned shared workbook. Shared workbook can have more than one user to edit, delete or change to the workbook. Why we use RejectAllChanges Workbook Metod using VBA? Shared workbook may have multiple users. Sometimes we may not needed the changes or modifications by the user, in that time we will reject all the changes by using RejectAllChanges workbook method using VBA. Here is the syntax to RejectAllChanges workbook method using VBA. When: It is an Optional parameter. It specifies when(time) all the changes are rejected in the workbook. Who: It is an Optional parameter. It specifies all the changes are rejected by whom. Where: It is an Optional parameter. It specifies where all the changes are rejected. In the above syntax Workbook is object and VBA RejectAllChanges method of Workbook object. Here is the syntax to VBA RejectAllChanges Workbook method using VBA.